Families Commission research released today Heart and Head, showed that 60% of fathers think the media portrayed them in a poor light, and half thought that society overall does not recognise their importance. The Families Commission is calling for four weeks paid leave for fathers with today’s release of their father research report. The report showed that fathers are asking for more time with their children. We have been approached to help recruit especially solo fathers to this study in order to make it as representative as possible of the population. See here for details. You’re asked to use the study code SOLOD if that applies to you. Fathers are called on to participate in a study on their experiences of a difficult birth of their baby. See here for more info. Father & Child Trust is looking for fathers who have day-to-day care of at least one child eight years or under in either Christchurch or Auckland. 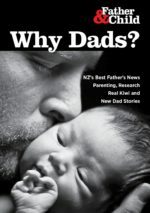 The Trust is conducting what is believed to be the first study in New Zealand on the circumstances, issues and support of solo fathers and their young children. Hands-on dads: we know how important they are…we know they’re out there… but how can we best support them? Had Experience in the NZ Family Court since 2014 – Have your Say!